It is 1939. Nazi Germany. The country is holding its breath. Death has never been busier, and will become busier still. By her brother's graveside, Liesel's life is changed when she picks up a single object, partially hidden in the snow. It is The Gravedigger's Handbook, left there by accident, and it is her first act of book thievery. So begins a love affair with books and words, as Liesel, with the help of her accordion-playing foster father, learns to read. Soon she is stealing books from Nazi book-burnings, the mayor's wife's library, wherever there are books to be found. But these are dangerous times. When Liesel's foster family hides a Jewish fist-fighter in their basement, Liesel's world is both opened up, and closed down. The Book Thief is a story about the power of words to make worlds. The Book Thief is unlike any book I have ever read before. The story is tragically beautiful and it will be the best book that you have read in years. Young Leisel Meminger shares her heartbreaking story growing up in Germany during World War II. Because this book exhibits such strong themes I would recommend it for a more mature audience. Reviewed by 01bh. 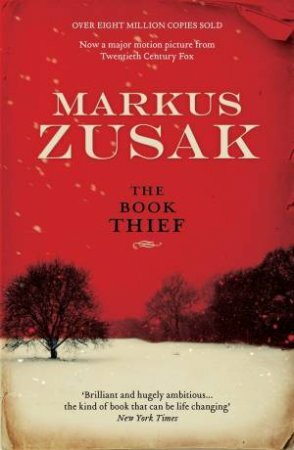 The Book Thief was an extremely enjoyable book. Once I started reading it was almost impossible to put it down. This is a great and excellent novel.